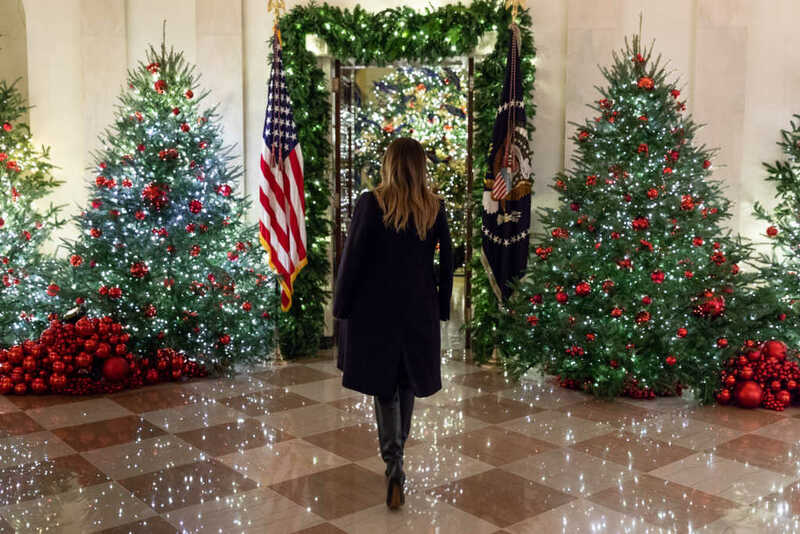 First Lady Melania Trump will not be having a blue Christmas this year, as the newly decorated White House halls will be donning red Christmas trees. The decorations center around the official White House Christmas Tree, an 18-foot Fraser Fir on display in the Blue Room. The North Carolina tree has over 500 feet of blue velvet ribbon encompassing it, with each state and territory’s name embroidered on it. The State Dining room is showcasing gingerbread houses resembling the Capitol, the Lincoln Memorial, the Jefferson Memorial, Washington Monument and the White House. Personalized family touches can be seen throughout the White House decorations, whether its soccer ball ornaments (a nod to Barron’s favorite sport) or “Be Best” ornaments, showcasing Melania’s initiative. There are also wreaths made from “Be Best” pencils in windows, also a nod to her initiative. The East Room gives a nod to Gold Star families who have lost a loved one in the military. The Gold Star tree is in honor of those that have served, and the families that stood behind them. The White House also set up tablets to let visitors write messages to their loved ones who are currently serving in the military. Melania also introduced a new tradition this year: adorning each White House window with a wreath. To check out more photos of the White House decor click here.